January 25, 2019 at 10 a.m. The persistence of climate change denial in spite of popular and scientific consensus of the human impact on global warming seems to dispute that such denialism is rooted exclusively in the misinformation of a deceived public. More often than not, climate change denial, according to the report by the American Psychological Association (2009), partakes in a “fiction,” i.e., in the invention of “other worlds” and “other people” as the sole beneficiary of climate catastrophe, leading us to wonder if denialism is not rather productive and generative, realizing itself as the obverse of a desperate hope: climate change is what happens to other peoples, in other places, and at other times; or that we can create an elsewhere where climate change is not happening; or the climate change only matters when it happens to us, inconsequential when it occurs elsewhere etc. 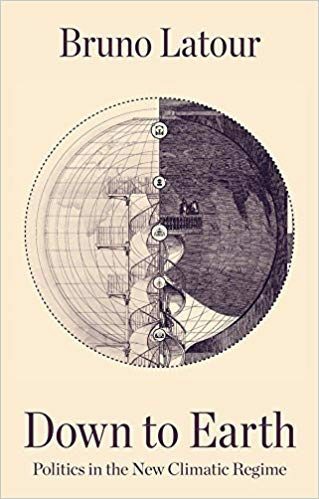 In Bruno Latour’s recent book, Down To Earth: Politics in the New Climatic Regime, the fiction of an “elsewhere” is incorporated into a narrative about globalization that has left some of us in “exile” (“deprived of land”), while others (“the elites”) inhabit an abstract universality—a narrative about globalization in which the earth progressively disappears. In a poignant image of unworlding, Latour describes modern man as a subject without landscape, a subject who seems to have lost his footing in the world right under his feet (85). Indeed, all manner of denials (political, ecological, social), Latour argues, may be traced back to the fundamental denial of the originary entanglement of “human” and social history in geological history, in effect, denying that our actions have re-actions in the world, or put differently, that the world is capable of being affected. And yet, Latour reasons: “If the Terrestrial is no longer the framework for human action, it is because it participates in that action. Space is no longer that of the cartographers, with their latitudinal and longitudinal grids. Space has become agitated history in which we are participants among others, reacting to other reactions. It seems that we are landing in the thick of geohistory” (42). This seminar invites explorations of the central concepts animating Latour’s writings such as (new) materialism; the Terrestrial (and the concept of nature that it is intended to “displace,” not to mention the assumptions behind the “displacement”); the “geosocial” and “object-oriented politics.” My own interest lies in formulating the specificity of climate change denial in relation to other philosophical modalities of negation, bad consciousness, skepticism, disavowal etc. My account seeks to resist the self-evident way denial appears even in Latour’s text as an error or a lack of truth that awaits correction. Instead, I am interested in the desires that generate or are generated by denial. In staying with the affective dimension of the problem, I also want to examine the role of the senses (of global “warming” or “cooling”; of the so-called sensible” effects of climate change; and not least, of the rhetoric of “common sense” which intimates the possibility both of consensus and/or a common sensibility) in climate change discourse. Bruno Latour, Down to Earth: Politics in the New Climate Regime (Cambridge, UK: Polity, 2018). American Psychological Association, “Psychology and Global Climate Change: Addressing a Multi-faceted Phenomenon and Set of Challenges,” 2009.